Wouldn’t it be nice if your staff worked with the precision of a fighter pilot and the efficiency of an operating room? If there was a method for reducing errors while increasing profitability? There is and that method is called “checklists”. As business owners we are driven to achieve success. It is who we are. And it is why we are entrepreneurs; working harder than most with higher risk so we can experience that success. Failure is anathema to our very being. But, by taking the precaution of contemplating failure we increase our chances for success. Harvard Business School Novartis Professor of Leadership and Management Amy Edmonson studies why businesses fail and suggests four questions you need to ask before starting a new venture in order to avoid failure. Is the glass half full or half empty? How you answer depends on your perspective. For someone who has always received a full glass and now is being told this is all the water available, this picture can be a perilous omen. On the other hand, someone lost in the desert might describe it as salvation. Perspective is critical when making decisions within your company. A distorted perspective can lead to the wrong decision, sometimes with disastrous consequences. Two experiences reminded me of the importance and scope of branding. 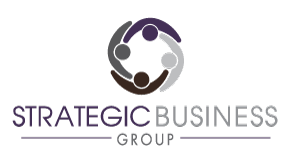 The first happened when I added a new website address meant to reinforce my branding, StrategicBizGroup.com, and then created this email address using that URL. The result was a number of you asking which of my emails to use. Also, a few of my clients have recently asked for feedback on their logo, using the words “branding” and “logo” interchangeably. This channels the marketing teacher in me which immediately starts to explain the difference between a “logo” and “branding”. Frustration is a common sentiment I hear from owners first seeking my advice. Their frustration stems from not having been able to achieve goals despite their unwavering efforts. Sometimes the owner had a plan but was not able to deploy it effectively. Or, the owner was always finding “great ideas” but ended up barraging his staff with a never ending list of “great ideas” not understanding why nothing got done. The other end of the extreme is the replication trap of being stuck in an endless do-loop, too busy to even consider alternative plans. These owners come to me for a fresh perspective; a different way of looking at their operations. I was reminded of the benefits offered by a fresh perspective from an unexpected source: A public school district.